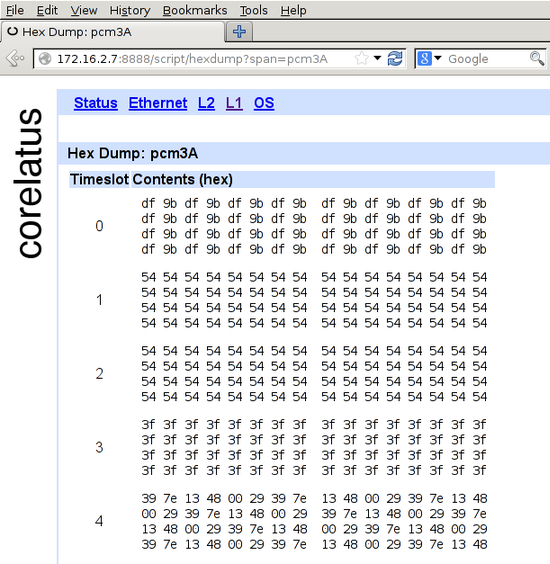 This post looks at a few simple tricks for understanding the WWW browser-based hex dump from a typical E1/T1 and then moves on to some more complicated things you can do with timeslot data by piping it to the standard (from BSD, but now on most unix-like systems) hexdump tool. The HTTP server is on port 8888. To get to the hex dump, click 'L1' (at the top), then the E1/T1 you're interested in, for instance pcm4A, then 'hex dump' (at the bottom). In the screenshot, timeslot 0 has a repeating two-octet pattern typical of an E1 link using doubleframe. Timeslots 1 and 2 have the default idle pattern for E1 links: hex 54. That's silence, so those timeslots are most likely unused for the moment. Timeslot 3 has nonstop 3f 3f 3f 3f. Writing that out in binary, 00111111001111110011111100111111, lets you see the pattern of six ones with a zero on either side. That's a flag. ISDN LAPD and Frame Relay links transmit flags between packets. Timeslot 3 probably contains LAPD signalling. There are eight possible bit rotations of the flag: 7e, e7, fc, cf, 9f, f9, 3f, f3. Timeslot 4 has a repeating six-octet pattern. That's an MTP-2 FISU. Timeslot 4 is almost certainly running MTP-2. There's no limit to how large such recordings can be, so if you're debugging something, you can leave the recorder running for hours. The example above demonstrates a neat feature in 'hexdump': 'hexdump' suppresses repeated data. So you can leave it running in a window and it'll only produce output when something changes. This post is for people who want to use C to control a GTH. Other languages (e.g. Erlang, Java, Python and Perl) are easier to work with, but in some applications you want the complete control that C gives you. Corelatus provides a C API for GTH. The C API lets you control a GTH using plain C function calls---all of the XML wire format is taken care of. // We want to record audio on the E1/T1 called "1A", on timeslot 3. The recording above happens in the 'while' loop. It continues forever (i.e. until you abort it). The audio data is bit-for-bit identical to what was on the E1/T1 timeslot, so this can be used for recording both voice and signalling. Monitor (sniff) SS7 MTP-2 and save the signalling to a wireshark (PCAP) compatible file. 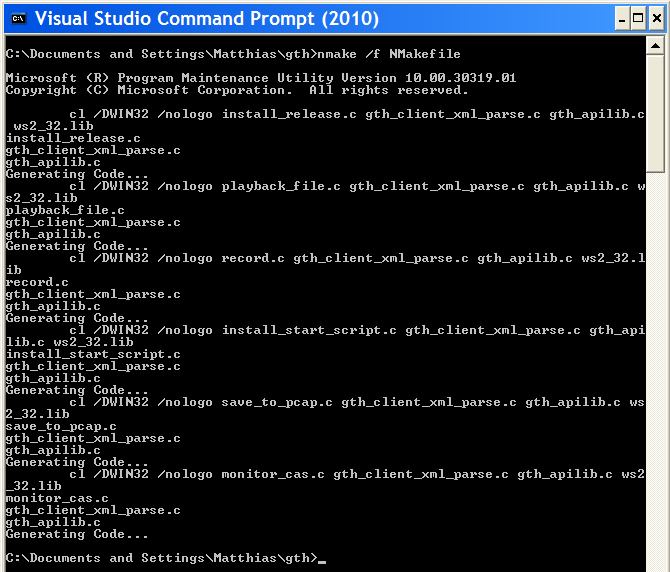 Aside: the C API code includes a standalone parser for the XML responses the GTH emits. You can use the parser without using the rest of the API library, if you want to.